Preheat oven to 190°C / 357°F. Line the baking pan with foil, and grease foil. In a sauce pan on Low, melt chocolate and butter. Stir in molasses, then eggs, one at time. Set aside. Combine in large bowl: flour, 1 C sugar, 1 TSP cinnamon, ginger, cloves, baking soda, and salt. Stir the dry mixture into the wet. Bake 15-17 minutes. 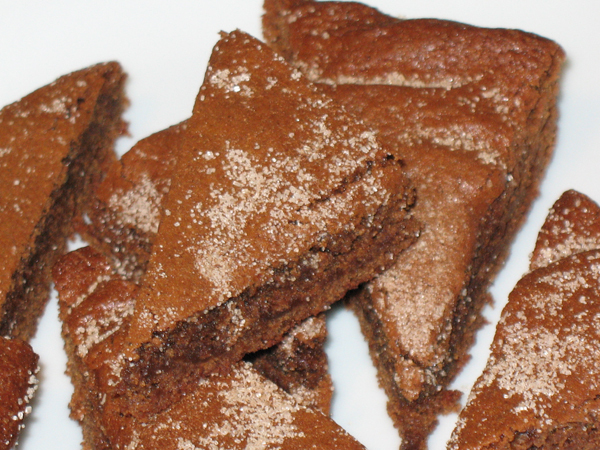 Brownies are done when a toothpick inserted 1 inch from the edges comes out cleanly. While this is baking, in a small bowl combine 2 TSP white sugar and ⅛ cinnamon. As soon as pan is removed from oven, sprinkle sugar mix on top, then cool on rack (in pan) 2 hours. Peel off tinfoil, slice lengthwise in 3 strips, slice crosswise in 5 strips, then cut each piece diagonally.